Sunburst 2 Inch Tin Heat Sensitive Thinking Putty allows creative tactile play for kids and adults. 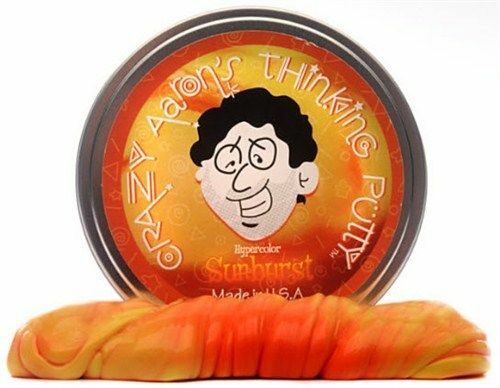 Sunburts 2 Inch Hypercolor Heat Sensative Thinking Putty by Crazy Aaron's is thermochromic -- just a touch from your hands or a warm coffee mug will reveal a new "hot" color. Allow it to cool off or stick it in the fridge! Then the "cool" color will be restored. These Heat Sensitive Hypercolors really make their mark! Just as an evening sky melts into the dark of night, Twilight Thinking Puttys deep purple color disappears with a touch of heat to reveal a fluorescent blue complexion. Crazy Aarons Thinking Putty Super Oil Slick 2 inch Tins for play and stimulation.